The deliverance, by the grace of God, from eternal punishment for sin which is granted to those who accept by faith God’s conditions of repentance and faith in the Lord Jesus. Salvation is available in Jesus alone (John 14:6;Acts 4:12) and is dependent on God alone for provision, assurance, and security. In the Christian doctrine of salvation, we are saved from “wrath,” that is, from God’s judgment of sin (Romans 5:9;1 Thessalonians 5:9). Our sin has separated us from God, and the consequence of sin is death (Romans 6:23). Biblical salvation refers to our deliverance from the consequence of sin and therefore involves the removal of sin. Only God can remove sin and deliver us from sin’s penalty (2 Timothy 1:9;Titus 3:5). 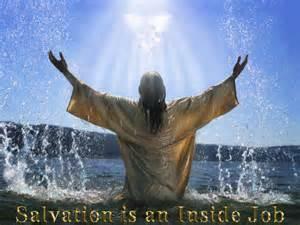 In the Christian doctrine of salvation, God has rescued us through Christ (John 3:17). Specifically, it was Jesus’ death on the cross and subsequent resurrection that achieved our salvation (Romans 5:10;Ephesians 1:7). Scripture is clear that salvation is the gracious, undeserved gift of God (Ephesians 2:5,8) and is only available through faith in Jesus Christ (Acts 4:12). We are saved by faith. First, we must hear the gospel—the good news of Jesus’ death and resurrection (Ephesians 1:13). Then, we must believe—fully trust the Lord Jesus (Romans 1:16). This involves repentance, a changing of mind about sin and Christ (Acts 3:19), and calling on the name of the Lord (Romans 10:9-10,13). We confess our past life of sin -- living for ourselves and not obeying God. So, when we pray, asking God for the gift of salvation, we're exercising our free will to acknowledge that we believe in Him. That demonstration of faith pleases God, because we have freely chosen to know Him. Say It & Mean It! You've Prayed It; Now What?